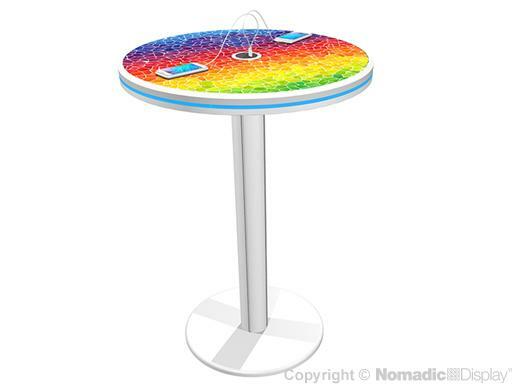 Get Powered Up with Nomadic’s 40” Round Bistro Charging Station. Make your trade show or conference more powerful and keep attendees at your booth longer by providing this beneficial innovative new solution! Take advantage of this great opportunity to engage with your customer and gain one-on-one time! Add your own custom brand graphic. Edge LED color lighting can be customized to your colors. Holds up to 20 charging cables for 5 different devices. Wiring strategically hidden in the table leg. Conveniently ships in a custom crate.